The Canals in Dehradun have an unequivocal significance in making the history and sustaining the life in Doon Valley. The non-negotiable eminence and the staggering architectural construction of these canals are not suppose to be out of the picture while painting an ideal Dehradun. The people who reside in this emerald town, barely have a wee bit of knowledge about the Chronicles of Dehradun Canals. So below is a tale of the Glory of the Canals in Dehradun, have a read of it to know your town’s heritage. The very first canal which was introduced in Dehradun was the Katapathar canal which was established in the majestic West of Dehradun. This canal was not so dependent on the seasonal rains for an adequate water supply as it derived water from the Yamuna River. The canal was designed by Captain Cautely in 1840-41 and it was constructed till 1847. The canal faced some damages due to the floods that were experienced in the area in the late 18 century, a 300 ft masonry channel of the canal was washed away. In 1896 this canal was rebuilt. The supply of the canal was maintained and it helped during the Rabi Season. The Bijapur Canal received its supply from the Tons River which flowed through the Vijaypur Village. Captain Cautley designed the Bijapur Canal in 1837 in a way that it transited its water in a triangular area of the Bindal River, which was nearby Tons, Asan and Dehra. In 1905 the canal head of Bijapur canal was reconstructed with the addition of an Aqueduct and lattice in it due to which it has an adequate supply even during the rains, as a number of pebbles and stones interrupted the flow of water in rainy seasons. These canals had to be rebuilt over the time as the flood waters used to wash it away consecutively. This led to an inadequate supply of water and higher cost of constructions. The Rajpur Canals were built 300 years ago, to supply drinking water in Dehradun. It gets its supply from the Rispana-Ro River. In the mid of the 17th century Rani Karanavati, the Rajput princess and her husband Raja Ajab Kunwar developed a pathway where the first irrigation system of Uttarakhand after they administered the area and gave existence to the Rajpur Canals. The Rajpur Canal supplied water to the Dera of Guru Ram Rai of Dhamawala who was then suffering with its scarcity in his Dera. The Rajpur Canal also supplied water to the Dhrampur region, as its appropriate construction led to an increase in its water supply and it was now not only used for supplying fresh drinking water but also in the irrigation of fields. The Rajpur Canals have been the oldest and the most prominent canal system of the town but it soon came back to its original state, due to change in climate and had a limited supply. Its water was now used in Civil Stations of Dehra where it is used for watering the gardens and lawns of the station. On the Western border of Eastern Doon is the Kalanga Canal ahead of the Rispana Ro River. Captain Cautley gave the orders to examine the head of the Song River very carefully so that a canal could be made out of it to nourish a portion of Eastern Dehradun. This was built in 1859-60, and in 1907 it had a new canal head which was built by using the method which were used in the construction of the canal heads of Katapathar and Bijapur Canal. As originally constructed the head of the canal was at a point on the Song River near the Raipur Village, down stream of Kalinga Hills. The canal supplied water in the villages of Raipur, Miawala, Harrawala etc. In 1902 two small canals namely the Balawala and the Nathuwala canals were constructed which were used to satisfy the household needs of the area. At present, the Kalanga canal receives its water from three rivers Sahastradhara, Bindal and Song River. The heads of the Sahastrdhara and the Bindal River are temporary whereas the Song river head is in the form of a barrage. 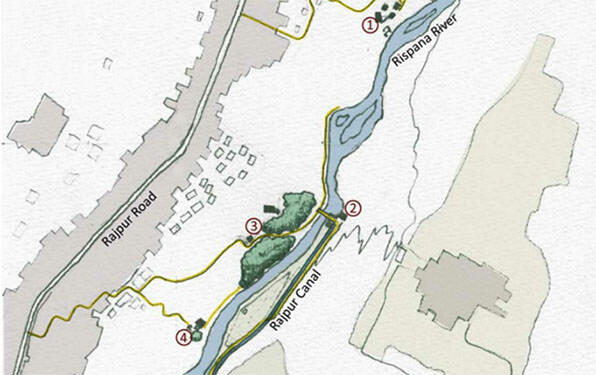 The Jakhan Canal was constructed in 1863-64 according to ‘The Gazetteer of Walton.’ It was formed from the origin of the Rispana Ro to Bhogpur. It takes off from the left bank of the Jakhan River and its head was built at a point that was 5 km above Bhogpur which was high up in the course of the river, so as to ensure the continuous supply of water. The water is turned into the canal by the means of a temporary damp. During the Jakahan Canal also supplied water to feeders from Aamgarh, Kua Khala, Mahadev Khala and Sansra Khala Torrents, Amgarh also receives the supply during the dry season. Being of so much importance yet these canals have a miserable fate ahead of them. The Canals which were responsible for keeping an adequate water supply in town and provide an enhanced irrigation practice for the well-known Basmati rice of Dehradun have fallen prey to the unsustainable approach of the past and the present government of the town. Talk to the indigenous people of Doon, the ones from the late nineties, will sing the tales of glory that the placid town of Dehradun holds. These canals are mostly exhausted now because of the unobstructed pressure that the city has faced over the past due to unplanned urbanisation. Farmers who had lands in possession nearby these canals had the privilege to sell them off, and now its bricks and concrete that stand tall on those lands. The climate conditions have made the canals suffer under open space, yet there are some of them left in rural areas of Thano, Maldevta and Bhogpur. Information Source- Gazetteer of Dehradun (H.G.Walton), Doon Mozaic, Uttarakhand Irrigation Department.